Australian indie studio Witch Beam brings Assault Android Cactus for Xbox One, a frantic twin stick shooter. If you’re up for a challenging non-stop arcade game, prepare yourself: choose your favorite android, sharpen your reflexes and embark with us into this laser-fueled adventure. The stars wait for you! 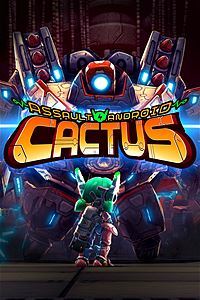 Assault Android Cactus has a considerable roster of characters for you to choose from. Our adventure starts with a garbled message received by the Interplanetary Police from the freighter Genki Star. Junior constable Cactus is designed to investigate what happened to the freighter. As Cactus approach the ship, she’s attacked by the defense system of the ship. Not to abandon the mission (and deal with all the paperwork if she abort it), she forces her way into the freighter with her tiny ship. There, she meets Holly, Lemon and Coral, androids that work inside the Genki Star and explain to her the situation. After a brief tutorial, you start the adventure with one of these four androids. The game is divided in zones, which one with four stages and a boss battle. Whenever you beat one of the bosses, you gain access to a new android (up to a total of nine). And each android plays very different from the others, granting a unique experience each time you play it. Each android comes with two weapons. Both weapons have unlimited ammo, but your secondary one needs to be reloaded or to cool down, depending on what character you’re playing with. You can change weapons anytime by pressing LT, except when your secondary weapon is reloading. And the movement of swapping weapons grants you momentarily invincibility, making it possible to dodge bullets, lasers and attacks from enemy robots. You’ll need to dominate this technique to reach the top of the leaderboard! Your primary weapon can be upgraded during gameplay. To do so, you must collect white energy orbs that enemies drop after being destroyed. A white bar under your energy bar shows your progression and current level (where your maximum level is three). Remember that, if you stay for too long without picking up energy orbs, you weapon downgrades so, to get the highest scores, you must always keep your weapon at the maximum level. To help you in your adventure, the game offers some power ups that enemies drop during gameplay: the red one gives you a pair of drones that shoot straight ahead when you’re also shooting. The yellow one gives your android wings, making its movement much faster. The blue one freezes your enemies for a few seconds. Picking power ups at the right moment can be the difference between victory and defeat. In each stage, your android has infinite lives. Whenever you’re knocked down, all she needs is to catch her breath and jump back into action. You only fail on a stage when your battery is depleted. To prevent this from happening, you must collect green batteries dropped by enemies during stages. The game is very generous, always dropping one battery for you when you’re almost out of time. Just remember that they’re usually dropped by the biggest foes. Sound in the game is great. It has its expected number of pews and zews of a game with robots, but the music is top-notch! Especially the music sung on mission failed screen, something very uncommon. Bosses in this game are amazing! At the end of each zone, you’ll face one of the section lords: huge robots with some transformations that’ll require some time until you find their weak spots and come up with a strategy to beat them. Very nice! With credits earned during gameplay, you can buy some modifiers that will change the way you play the game. The one I’ve found most interesting was the option to switch your secondary weapon for a golden and more powerful version of your primary one. But you also have other interesting options lake changing the camera, the music and adding bots to help you in your solo adventure. Suit yourself! With so many good things about this game, I almost forgot to mention Assault Android Cactus can be played in four players coop (only local, unfortunately), making it a good call for that game night with friends. And all of its three game modes, Campaign, Infinite drive (survival) and Daily challenges can be played with your mates. Your androids and enemies have good graphics and animations, but the same can’t be said about your surroundings, which are very simple. I totally understand that your focus will be on the action most of the time, but they deserved some more attention. At the first stages, the level design bothered me: most of the rooms were round or square-shaped with nothing really interesting. Things changes as you progress to later levels. Although enemies have a good design, soon you’ll notice that some enemies are repeated two or three times with different colors and behaviors. You’ll forget about this issue at later levels, when all kinds of enemies are on the screen at the same time! Even with all its qualities and replay value, game tends to become repetitive after some time. Especially when you’re playing alone. Assault Android Cactus is an amazing game, with that ‘just one more level’ feeling that really hooks you up! It has addictive gameplay, with lots of characters, providing a great replay value. If you like frenzied games with dozens of enemies on the screen at the same time yelling for you to shoot at them, give it a try. Even better if you have some friends to come along with you. You won’t regret it! Dev:Witch Beam Publisher:Witch Beam Played on:Xbox One LifeisXbox received a digital review code, provided by Stride PR.